You may want to print a copy of these instructions to have on hand as you complete the sections of the application. This section provides an overview of your application. Click Here for a sample of this section. It will display the Date Created and the Status of your application. Each section of the application will indicate whether it is Incomplete or Complete. There are also indicators stating whether or not your Transcript and Tax Returns have been received. 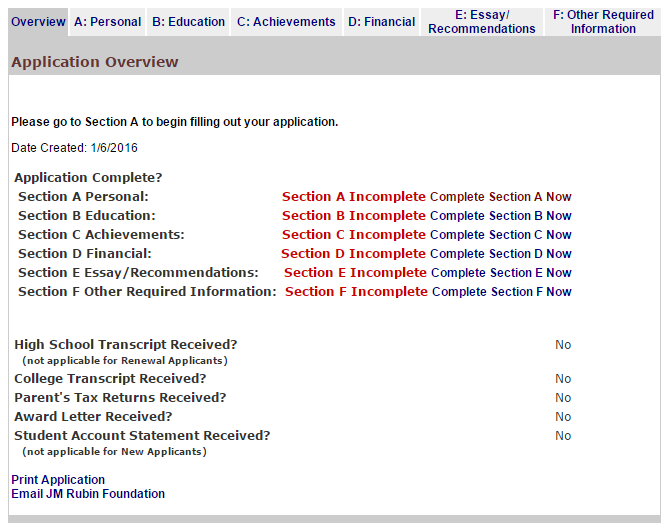 The status of your application will remain pending until all sections are complete. Upon completion of all sections, a Submit Application button will appear. You must click on this button to indicate to us that your application is complete and you would like to be considered for our scholarship. 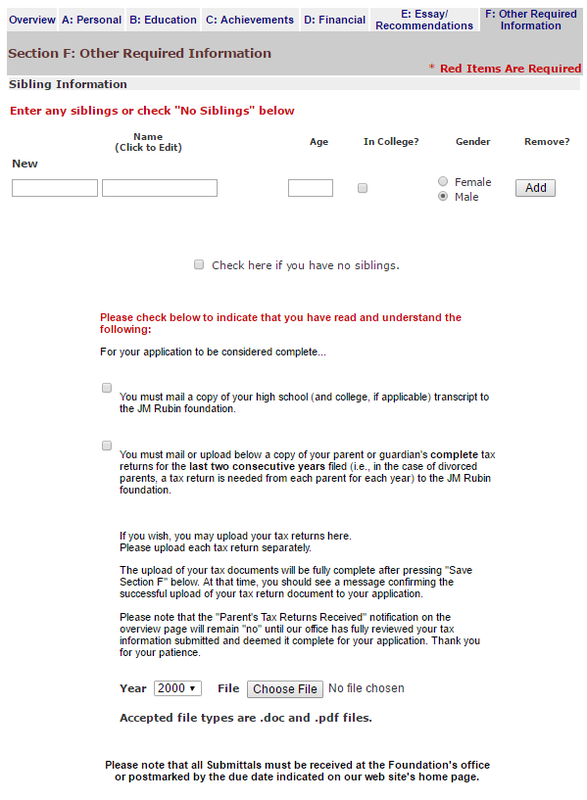 If the button is not clicked, then you are indicating to us that you are aware your application is incomplete and do not want to be considered for our scholarship. It is recommended that you print a copy of your application for your records. This section applies only to current JM Rubin Scholars. This section should be completed as well as the updating of any other sections when applying for renewal of your JM Rubin Scholarship. This section gathers information regarding your personal background and information such as name, address, gender, etc. Click Here for a sample of this section. If parents would like an email copy of correspondence sent to the student, please insert an email address in the Parent or Guardian Information. When all fields are complete, please click on Save Section A and follow the on screen instructions to move to another section. 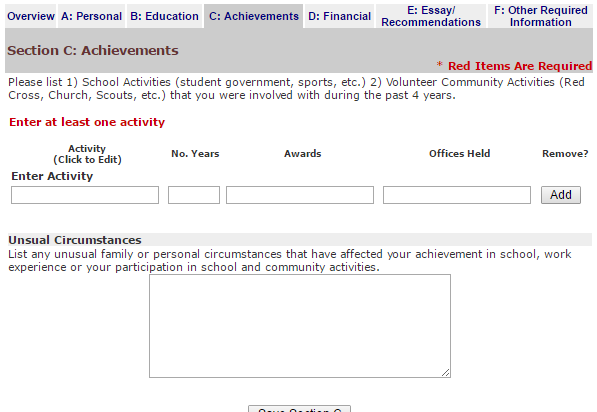 This section gathers information regarding your high school and college attendance and achievement. Click Here for a sample of this section. For test scores, please enter all that apply. If you are entering an SAT score, please enter the current three part score (maximum total of 2400) unless you took the test prior to the conversion to a three part test. In that case, you may enter the 2 part score (maximum of 1600). Please enter the name and required information of your first choice of college or university that you plan to attend. Anticipated costs for your first choice of college can be obtained from the schools website or from information you have received directly from the college. Please enter costs for the school year in which you are applying. Residence: Please select where you will living while at college. If applicable, please enter a second and third choice of school that you would like to attend. When all fields are complete, please click on Save Section B and follow the on screen instructions to move to another section of the application. Click Here for a sample of this section. Please list at least one school activity or volunteer community activity that you have participated in. You may list as many as you like. You may also email us a resume or summary of activities to be placed with your application. Unusual Circumstances (optional): If there are unusual circumstances that have affected you in any way that you would like us to consider in the review of your application, please describe them in this area. This section gathers information information regarding your expected financial situation in college. Click Here for a sample of this section. 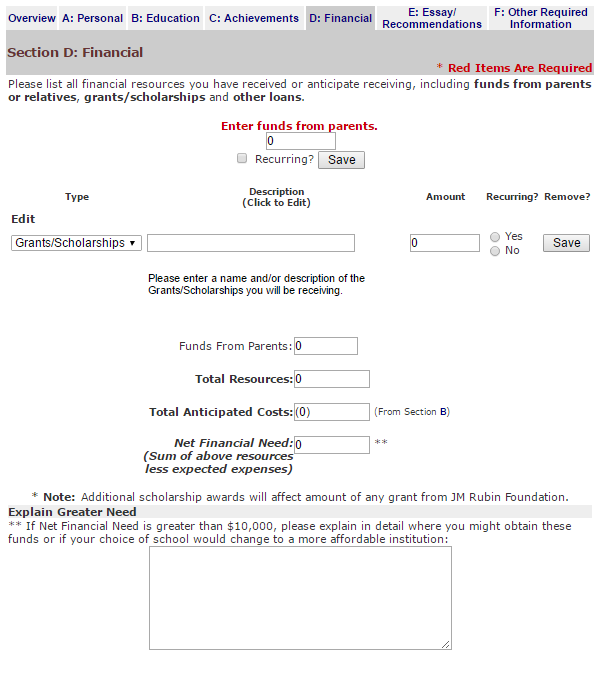 The Funds from Parents field should be filled in with the amount your parents can and expect to contribute to your college education per year. Please list any grants (federal, etc.) and scholarships you are planning to receive each year. Please indicate whether these scholarships will be recurring each year or are only a one time scholarship. Please list also any loans that you expect to take out at least for the first year as we know this information is dynamic each year. We are aware that you may not know all of this information by March 1st, but please complete based on what you do know and update it as new information becomes available to you. If the Net Financial Need number is greater than $10,000, please explain in the box provided how you feel you would obtain these funds or pay for your college education. This section is a required essay. Click Here for a sample of this section. It is required that you write an essay in the box provided outlining your personal goals and objectives. However, there is no required length. It is up to the applicant as to how they would like to approach and complete this essay. We also require at least two recommendations from someone in your school, community or employment. You may invite the recommender through our website and an email will be sent to them allowing them to create and submit a recommendation letter directly to our website and your application. 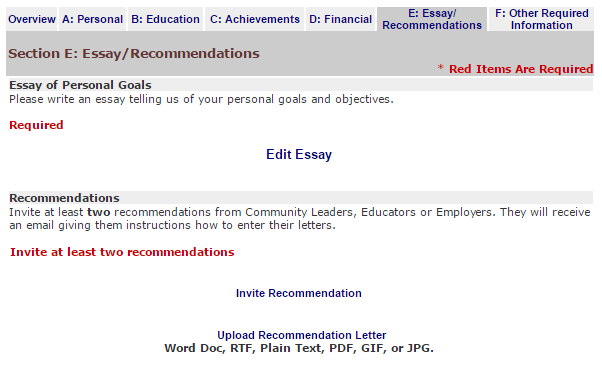 You may also upload a recommendation letter if you already have one in hand. In the sibling information sections, please enter your siblings or check "No Siblings" whichever is applicable. Click Here for a sample of this section. 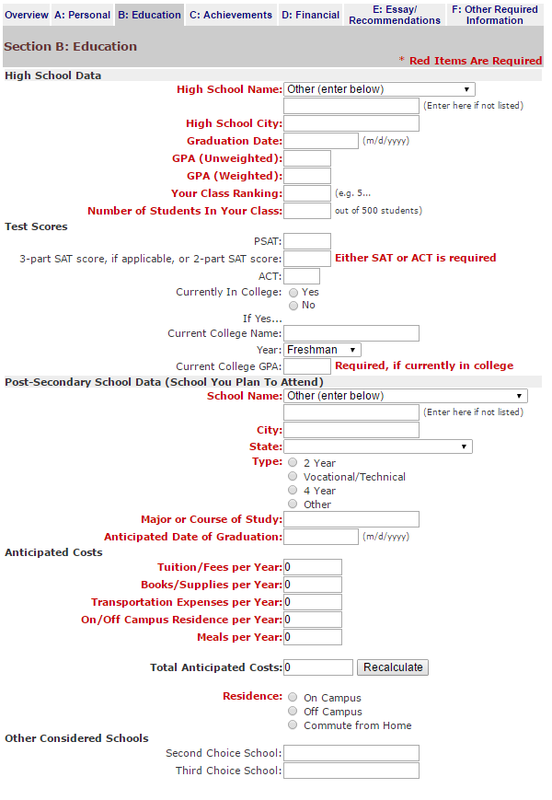 It is required that you read and check the boxes to make sure you understand that we must have an official high school and college transcript sent to us in order for your application to be complete and to be considered. This must be received or postmarked by March 1st. It is also required that you read and check the box where two complete consecutive years tax returns must be submitted to us in order for your application to be considered complete and to be considered. These may be uploaded in this section as indicated (recommended method) or they may also be emailed or mailed to us. If the current tax return is not yet complete, then we will accept the prior most recent two consecutive years. VERY IMPORTANT: These tax returns must be COMPLETE. This means that submitting only page 1 and 2 will not be considered complete unless you filed a 1040 EZ. We must receive all pages as they were filed with the IRS including all Schedules such as Schedule A, Schedule B, etc. If the complete returns are not submitted, then your application may not be considered. Please black out or remove all social security numbers from your tax return prior to submitting to us. These must be received or postmarked by March 1st.